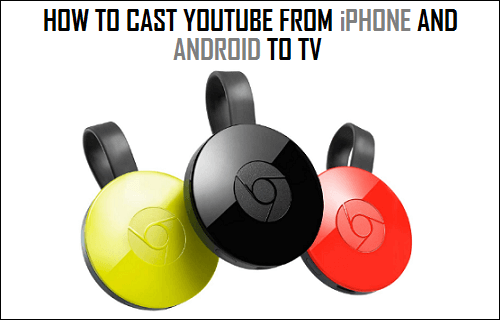 Chromecast is an affordable device that can be used to Cast or Mirror TV Shows, Movies, Sports and Videos playing on your Computer onto the large screen of your TV. You will find below the steps to Cast YouTube Videos playing on your iPhone or Android Phone on to the large screen of your TV. As mentioned above, Chromecast can Mirror or Duplicate the display on your Laptop, iPhone or Android Phone on the large screen of your Television without using any cables or wires. What makes this even more convenient is that you can use your Mobile device as remote control for your Television. You can raise or lower the volume and Pause, Forward or Rewind the Video playing on the Television using your Mobile phone or tablet. Chromecast is an inexpensive device ($35) and is easy to setup. You can take a look at our guide: How to Setup Chromecast Using Android and iPhone, in case you haven’t setup Chromecast yet. Follow the steps below to Cast YouTube Video playing on your iPhone onto the screen of an HDTV. 1. First, make sure that your Chromecast and your iPhone are connected to the same WiFi Network, otherwise you will not be able to cast videos. To check which WiFi network your iPhone is connected to, tap on Settings > WiFi. 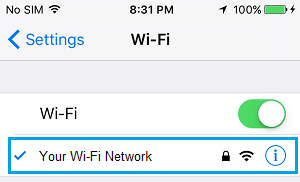 You will be able to see the name of your WiFi network on the WiFi Settings Screen of your iPhone (See image below). 2. After making sure that both the Chromecast and your iPhone are connected to the same WiFi network, open the YouTube App on your iPhone. Note: In case you do not have the YouTube App, you can easily download it from the App Store. Follow the steps below to Cast YouTube Video playing on your Android onto the large screen of your Television. 1. First, make sure that your Android Phone and Chromecast are connected to the same WiFi network. 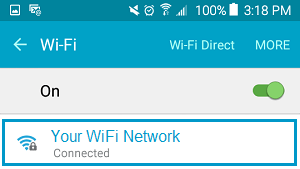 To check which WiFi network your Android Phone is connected to, tap on Settings > WiFi and see if your Android phone is connected to the right network. Note: In case the app is not installed on your device, download the app from the Google Play Store. 3. Next, open the YouTube Video that you would like to Cast onto the large screen on your TV.